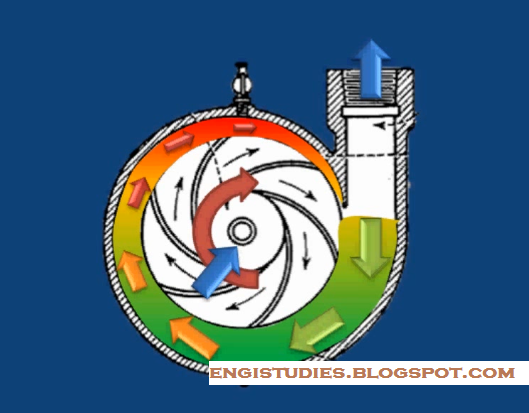 The article explains the basic principle of Centrifugal pump working with its pump diagram. Mostly used in industries, centrifugal pumps are the simple hydraulic machines. They are sub-class of axisymmetric work absorbing turbo-machinery. The basic principle on which this pump works is that when a certain mass of liquid is made to rotate by an external source, it is thrown away from the central axis of rotation and a centrifugal head is impressed which enables it to rise to a higher level. To understand the principle and working, at first we should learn about its major parts. The major body parts of a centrifugal pump are the impeller, casing, suction pipe, and delivery pipe. It is the heart of the pump. It consists of a number of curved vanes mounted inside the shroud plates. It is fitted on a shaft, connected to an external electric motor. The motor with the help of the shaft rotates the impeller. The surrounding fluid also rotates with it and moves radially out. The impellers can be classified as closed, semi-opened and open impellers. The airtight chamber surrounding impeller is called casing. The cross-sectional area of the chamber increases along the flow path. It receives the fluid pumped by the impeller. It then decreases the flow rate. It is connected to the center of the impeller. It lifts up the fluid from the suction tank. The lower end of the suction pipe is fitted with a foot valve and strainer. It is coupled with the outer end of the centrifugal pump. Its function is to deliver the fluid to the desired level. Fluid is first received by the suction pipe axially through the eye of the casing. It is then whirled tangentially and radially outward by the impeller creating centrifugal action. 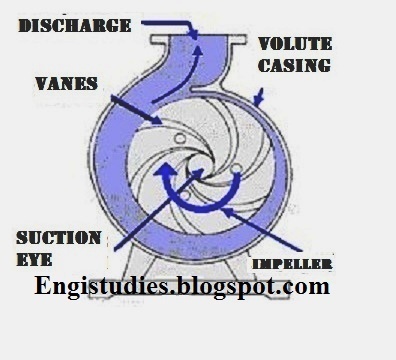 Due to this action fluid gets higher velocity and passed out of the impeller. Why it is necessary to prime the pump? Because of the fact that most of the centrifugal pumps are not self-priming, one should do the task manually. When the level of fluid in the suction pipe is less than the level of the pump, the priming is to be done. Priming is the most important thing to do before starting the pump. It will minimize most of the problems which will arise later. To prime the pump, first, open the isolation valve. open its air vents to pump fluid out of it. Now, close the air vents. Below is the pump diagram showing part names. It is self-explanatory. The classification is done considering various factors such as number of stages, type of flow, material used to manufacture etc. To gain more differential pressure sometimes the number of impellers are increased. According to the count the pumps are called single stage or multistage pumps.